RT 2095 - Jan 2, 1964 (Jan 4-10) (London) STEPTOE AND SON - with main cover photo of Harry H Corbett and Wilfred Brambell / HUGH AND I - Terry Scott and Hugh Lloyd / TOMMY STEELE. 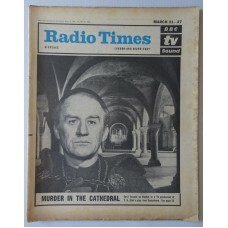 RT 2097 - January 16, 1964 (Jan 18-24) (London) MARTIN CHUZZLEWIT - with cover photo of Gary Raymond, Ilona Rogers and Barry Jones . 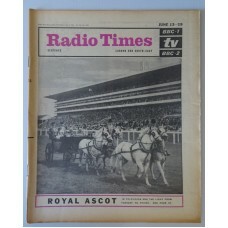 RT 2098 - January 23, 1964 (Jan 25-31) (London) WINTER OLYMPICS NUMBER with cover photo of skiing. RT 2099 - January 30, 1964 (Feb 1-7) (London) A SONG FOR EUROPE with cover photo of Matt Monro. RT 2100 - February 6, 1964 (Feb 8-14) (London) [Incomplete] THE LADY OF THE CAMELLIAS with cover photo of Billie Whitelaw and John Fraser. RT 2101 - February 13, 1964 (Feb 15-21) (London) FIRST NIGHT / THE SCAPEGOAT with cover photo of Kenneth More. 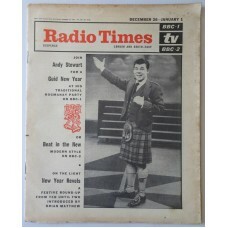 RT 2104 - March 5, 1964 (Mar 7-13) (London) COME DANCING - South London v West Scotland - with cover photo of Peter West. RT 2105 - March 12, 1964 (Mar 14-20) (London) [Incomplete] MEET SAMMY DAVIS - with cover photo of Sammy Davis Jr.
RT 2106 - March 19, 1964 (Mar 21-27) (London & South-East) [Incomplete] MURDER IN THE CATHEDRAL with cover photo of Cyril Cusack as Becket. 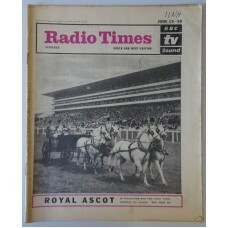 RT 2107 - March 26, 1964 (Mar 28-Apr 3) (London & South-East) EASTER - with cover photo of daffodils. 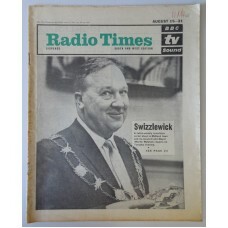 RT 2109 - April 9, 1964 (Apr 11-17) (London & South-East) THE GOOD OLD DAYS with cover photo of Leonard Sachs. 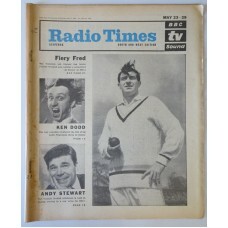 RT 2115 - May 21, 1964 (May 23-29) (London & South-East) FIERY FRED (BBC-1) with main cover photo of Freddie Trueman / ANN VERONICA (BBC-2) Rosemary Nicols / THE KEN DODD SHOW (Light) with photo. 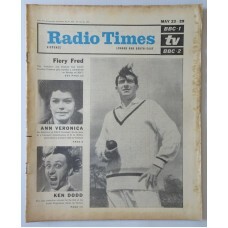 RT 2115 - May 21, 1964 (May 23-29) (South & West) FIERY FRED (BBC-1) with main cover photo of Freddie Trueman / ANN VERONICA (BBC-2) Rosemary Nicols / THE KEN DODD SHOW(Light) with photo. 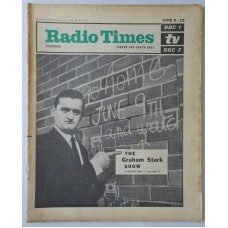 RT 2117 - June 4, 1964 (Jun 6-12) (London & South-East) THE GRAHAM STARK SHOW (BBC-1) with cover photo. 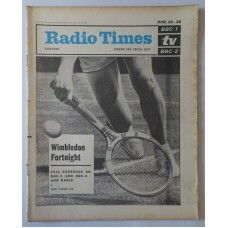 RT 2119 - June 18, 1964 (Jun 20-26) (London & South-East) WIMBLEDON with cover photo of close-up play. 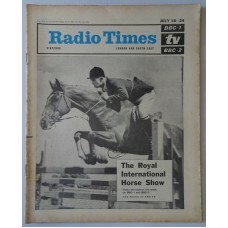 RT 2123 - July 16, 1964 (Jul 18-24) (London & South-East) [Incomplete] ROYAL INTERNATIONAL HORSE SHOW with cover photo. 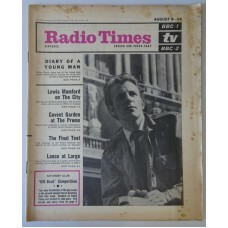 RT 2126 - Aug 6, 1964 (Aug 8-14) (London & South-East) DIARY OF A YOUNG MAN (BBC-1) with cover photo of Victor Henry. 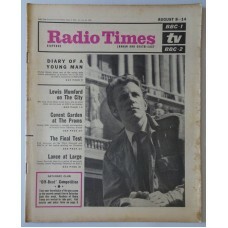 RT 2126 - August 6, 1964 (Aug 8-14) (London & South-East) DIARY OF A YOUNG MAN (BBC-1) with cover photo of Victor Henry. 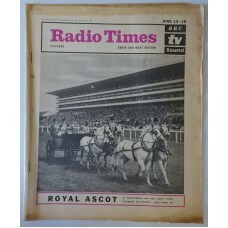 RT 2128 - August 20, 1964 (Aug 22-28) (London & South-East) THE CHILDREN OF THE NEW FOREST - with cover photo of Bernard Archard. 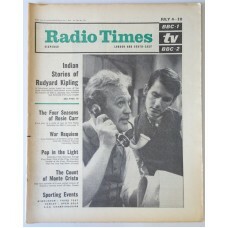 RT 2129 - August 27, 1964 (Aug 29-Sep 4) (London & South-East) HOLLYWOOD AND THE STARS - with cover photos of a dozen big film stars. 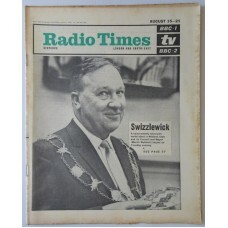 RT 2130 - September 3, 1964 (Sep 5-11) (London & South-East) Z CARS (BBC-1) with cover photo of Stratford Johns. 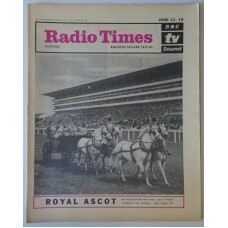 RT 2132 - Sep 17, 1964 (Sep 19-25) (London & South-East) DIXON OF DOCK GREEN with cover photo of Jack Warner. 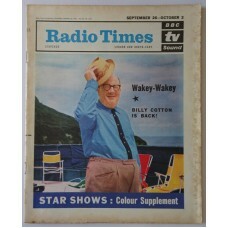 RT 2133 - September 24, 1964 (Sep 26-Oct 2) (London & South-East) THE BILLY COTTON BAND SHOW Wakey-Wakey - Billy Cotton Is Back! With full-colour cover photo. 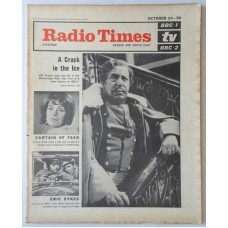 RT 2134 - October 1, 1964 (Oct 3-9) (London & South-East) THE COUNT OF MONTE CRISTO with cover photo of Alan Badel. 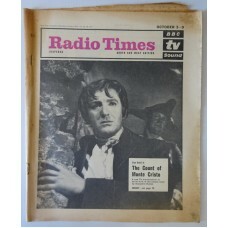 RT 2134 - October 1, 1964 (Oct 3-9) (South & West) THE COUNT OF MONTE CRISTO with cover photo of Alan Badel. RT 2135 - October 8, 1964 (Oct 10-16) (London & South-East) OLYMPIC GAMES Tokyo  with Olympic colour cover design (by Victor Reinganum). 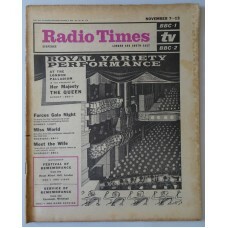 RT 2139 - November 5, 1964 (Nov 7-13) (London & South-East) ROYAL VARIETY PERFORMANCE - in the presence of Her Majesty The Queen - with cover (by Victor Reinganum) of the theatre. 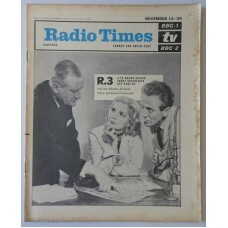 RT 2140 - November 12, 1964 (Nov 14-20) (London & South-East) R.3 (BBC-1) with cover photo of John Robinson, Elizabeth Sellars and Richard Wordsworth. RT 2141 - November 21-27, 1964 (London & South-East) DR WHO and the Daleks - with foreground photo of a Dalek and background photo of Daleks in Trafalgar Square.